The Android Studio team has been kicking out preview builds at a fevered pace since the first 2.0 preview hit the scene near the end of November, and it's finally paying off as the first real Beta is now rolling out. (The first beta has an issue, so this is actually labeled Beta 2). The jump from v1.5 to v2.0 is enough to suggest that this could be the most ambitious update to the IDE since it was launched, but the feature list confirms it. We've already covered some of the biggest features: instant run, GPU profiling, and a massively faster and more functional emulator. Additionally, the IntelliJ base has been upgraded to v15.0.3, which further improves stability and adds a host of new features. For an overview of the big items, check out the video below. As the video points out, many improvements have been made to speed up build times. Steps are taken to avoid redundant build activities, particularly those that can be cached from a previous build. Packaging is also done more quickly by excluding resources that aren't necessary for a particular build. There is also a new Shrinker tool that takes the place of Proguard's slower processor, and an optimized ADB protocol for faster communication with the new emulator. Improved performance isn't just limited to faster builds, it's also a big part of what makes the new emulator pretty great. But it's not just about speed, there are plenty of new features like convenient zooming and scaling of the emulator view, easier to use controls, drag & drop support, and several new simulators to replicate the conditions of a phone call, changing GPS coordinates, and much more. There's also a GPU profiler that makes it easy to capture the state of the GPU as it renders a scene, making it much easier to identify and diagnose bugs in the code or problems with textures. Android Studio gains many advantages from being built atop IntelliJ IDEA. New features and improvements are made to IntelliJ at an alarming rate, and are certainly too numerous to list here. Just check out the What's New page to see the latest additions (note: this page changes with each new major release, which is quite frequent). There are far too many things to list here, but I would just like to point out one small detail that caught my attention: Hi-DPI support for Windows and Linux. Now that so many people are upgrading to better laptop and desktop screens, there's no tool that deserves high res graphics more than our IDEs. Yey for saving our eyes! There are also huge improvements to language support, code inspection, version control plugins, unit testing, and more. The Beta 2 release has been sent out to the Canary channel to ensure that there aren't any oversights or breaking issues, but it's expected to hit the Beta channel within a few days. 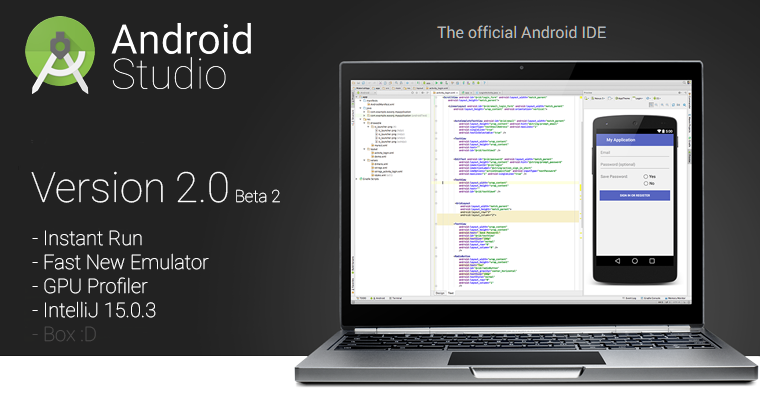 Aside from a few more bug fixes, not much is likely to change before Android Studio v2.0 goes Stable. If you're anxious to try the new toys, switch over to the Canary channel and let Android Studio do some updates. Be advised your gradle scripts will probably require a few changes, but most or all of them can be done automatically by the IDE. Android Studio also supports multiple installations, so you can continue running an older stable release while also testing out the latest versions. Just check out the download page and pick the version that works for you.